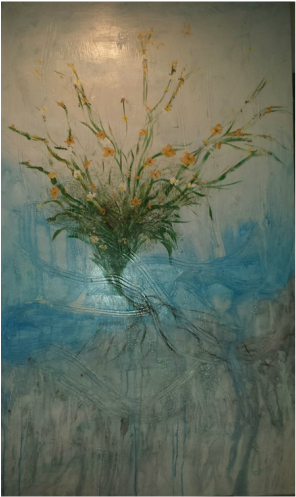 This painting was inspired by the vase of wildflowers I had picked after my brother died in June this year. This painting was an emotional journey toward the healing of my broken heart. After applying the texture and background, I just couldn't decide how this painting should evolve. I was studying the canvas late one night and I asked God for His direction and for a title. I thought the painting would include the beautiful cobalt blue vase and my Grandmother's antique table it was setting on, but I definitely wanted the focus of the painting to be on the wild flowers. Since my brother was being cremated and I didn't have a memorial service, these were the only flowers that I had to honor the memory of my little brother. I had started my day that morning praising God for His creation starting in Genesis at the very beginning when He created everything. I continued praising Him for the creation of a baby in the womb, then birth and how He even provided for His creation by providing milk from the mother's breasts. I was consumed that morning be the magnificent mystery, beauty and wonder of life being created from nothing. As I lay in bed that night, I continued studying the canvas and the way the paint had dripped and puddled and run along the textures. At that moment, I saw in the background the faint image of two hands, one below and one above as if they were ready to form life from clay. Above was the light and below was the very sustenance and foundation provided for the growth of the flowers. I realized that if I painted the vase and the table, this glorious vision in the background would be obscured. 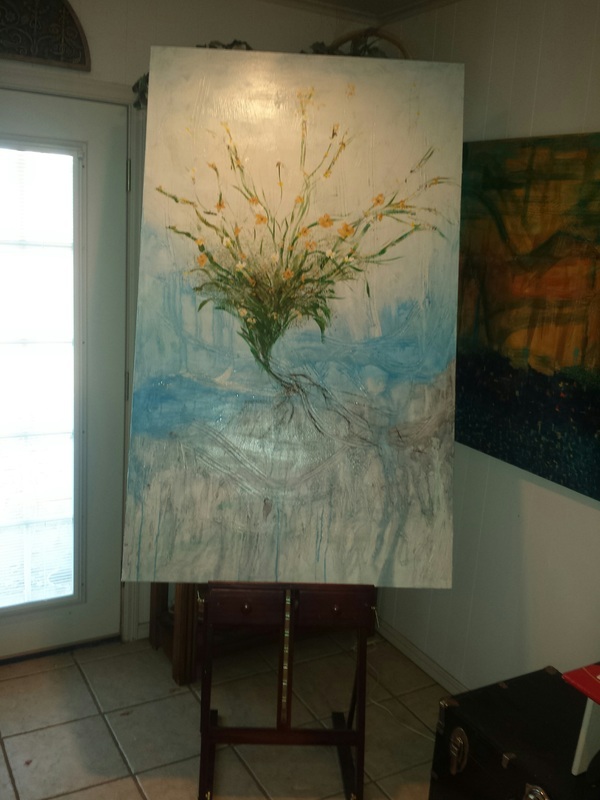 The flowers should emerge from the painting as the focal point as they were being created by God's Hands. As I painted, God's creation, the wild flowers, were the main event in the process of my humble creation of this painting. God's creation: Only by the Hands of God Is Life Created. P.S. This is the first painting I have painted in 2 1/2 years. God heals us in so many ways and in His timing. I am His creation. I pray this painting means as much to the viewer as it does to the painter. God's blessings.